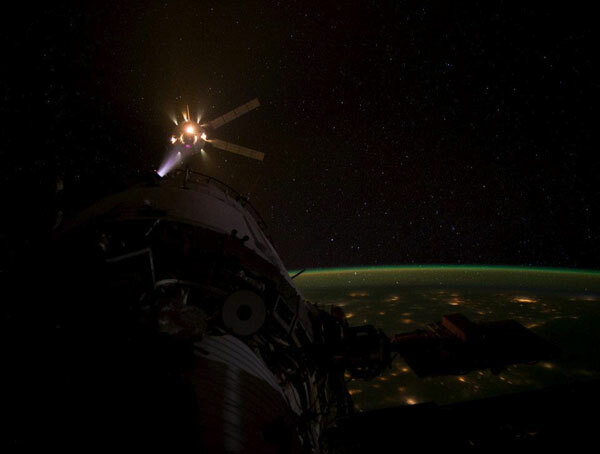 Europe&apos;s Automated Transfer Vehicle (ATV) Docks, Breathing Fire and Bringing Good Stuff. Author dpettitblogPosted on March 29, 2012 March 19, 2013 Tags General16 Comments on Europe&apos;s Automated Transfer Vehicle (ATV) Docks, Breathing Fire and Bringing Good Stuff. The sky is not the limit for producing artistic compositions. Put a camera on a tripod, point at a dark starry sky, and hold the shutter open for about 10 minutes, and the image will show stars as circular arcs. Normally, these star trails are created as the Earth rotates on its axis, with the center being close to either Polaris, the north star, or the Southern Cross, depending on which hemisphere you are in. 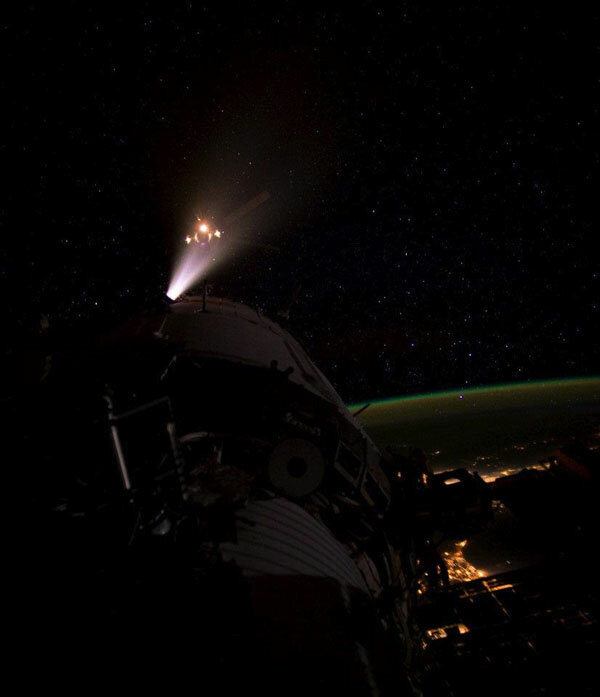 I got the idea to do the same thing from Space Station; however, the physics of orbit adds a special twist. 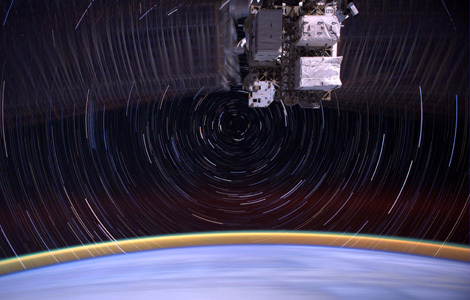 As Space Station orbits, it keeps one side always facing the Earth (the nadir direction from our point of view). This requires the Station to complete one revolution about its axis each orbit, just like the Moon. ISS rotates about its center of mass, which happens to be in the Unity, or Node 1 module. So it rotates almost aligned with the Station’s long, backbone-like truss. Space Station makes one revolution every 90 minutes (the Moon takes 28 days). 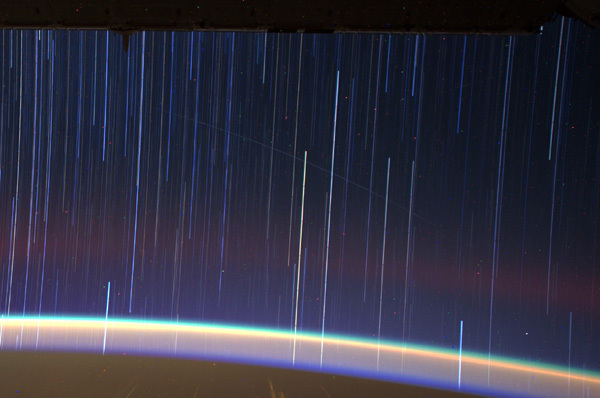 As a result, long-exposure pictures taken from the Station show star trails as circular arcs, with the center of rotation being the poles of Space Station (perpendicular to our orbital plane). Space Station is inclined 51.6° from Earth’s equator, so the “poles” are now at 38.4°. My star trail images are made by taking a time exposure of about 10 to 15 minutes. 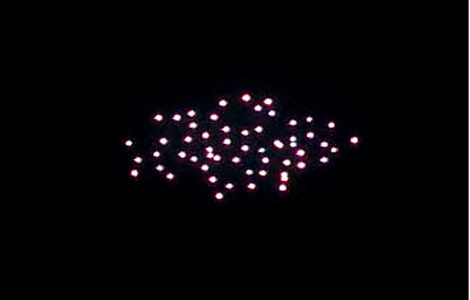 However, with modern digital cameras, 30 seconds is about the longest exposure possible, due to electronic detector noise effectively snowing out the image. To achieve the longer exposures I do what many amateur astronomers do. I take multiple 30-second exposures, then “stack” them using imaging software, thus producing the longer exposure. Due to our altitude, it is possible to see both the north and south axis of our orbit at the same time. This makes possible star trail images with two circles defined by arcs with opposite inflections. This geometry is hard to arrange from only one window so I use a fisheye lens, one with a full 180° image circle, to make this composition. In addition to the star trails, many other phenomena of nature can be seen. But I’ll save that topic for another post. Gold, silk, andspices were tangible treasures from past exploration. The Conquistadors wereparticularly good at extracting gold from the local inhabitants. Sir FrancisDrake, before he acquired the title of “Sir,” brought back enough treasure fromhis circumnavigation of the globe to provide more than half the income for theBritish crown for an entire year. The frontiers of space likewise offertreasures won from exploration, treasures that will enrich our lives andenhance our standard of living. These treasures are golden but not gold. Theycontain secrets about the biochemistry of life, and will allow us to increaseour understanding of how life functions. No more silver and gold; from SpaceStation we have blood, spit, and urine, treasures that contain secrets morevaluable than a chest filled with pillaged Aztec gold. On SpaceStation, we are human guinea pigs for a wide variety of medical experiments.The weightlessness of space offers a biochemical challenge to our bodies, whichdevelop a host of fascinating maladies such as bone decalcification, cataracts,retina swelling, eye focus shifts, smooth muscle atrophy, fluid imbalance,gross weight loss, cardiovascular degeneration, and more. In spite of thesemaladies, humans can thrive in space, proving that as a species, we are a hardylot and can explore places where we were never meant to go. 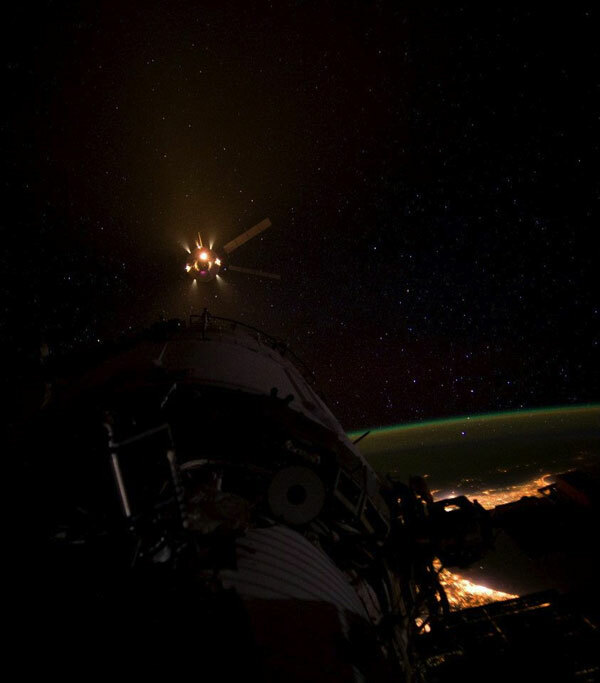 Themicrogravity of Space Station allows for yet one more experimental variable,offering an amazing and unique environment in which to study human physiology.Mother Earth throughout time has tormented creatures with every possiblevariation of environmental parameters. She has tweaked temperatures from hot tocold, pressures from high to low, chemical compositions from reducing to oxidizingand acid to base, and more. She has thrown stones at us from space and spewedout molten rock and ash from within. The layers of rocks are littered withfossils of hapless creatures that could not make the grade, or, through nofault of their own, were simply caught in the wrong epoch of geologic time. Thehistory of life on Earth is the story of species extinction, a fascinatingthought for those of us that are still here and can contemplate such aconstruct. With all thischange, with all this process, throughout all the evolution, the one factorthat has been constant for billions of years is the magnitude of Earth’sgravity. Now we can venture off the planet and for the first time in thehistory of life, vary the influence of gravity by a factor of one million. Thefact that we can survive in space is in itself an amazing discovery. We trulyare off in a new frontier, one that life has never seen on Earth, and it is onthis frontier that physiological secrets can be pried from the people who gothere. 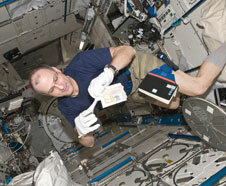 As the crew of SpaceStation, we routinely puncture veins, drool on cotton swabs, and urinate inbags. These samples are processed in centrifuges, sprinkled with preservatives,placed in tubes, and stored in MELFI, better known as “the freezer.” Kept at -98° C, these samples are stored for monthsbefore return passage to Earth can be arranged. To ensure safe passage of thesetreasures through the ride back to Earth, NASA has developed a special cold boxthat keeps them frozen for several days, ensuring unthawed recovery by groundcrews, happy life science researchers, and crew members relieved to know thattheir bloodletting was not in vain. The cold boxesthemselves are an engineering marvel. They are nearly equal in thermalconductivity to a vacuum dewar (Thermos bottle) with only a fraction of themass. They are made from truly space-aged materials; aerogel and Mylar. Aerogelis the most gossamer solid material known. Appearing more like solid smoke,aerogel has a density only 10 times greater than that of air (steel has adensity 7,000 times greater than air) making it one of the best thermalinsulators known, bested only by vacuum. Aerogel is brittle, readily crumbinginto dust. To prevent this eventuality, it is placed inside a skin of Mylar(plastic) film. The air is then sucked out, making this structure as rigid as avacuum-packed bag of coffee (which feels brick-hard until the package isopened). These Mylar-packed aerogel structures can be made into odd shapes,enabling cold boxes to fit in unused pie-shaped spacecraft volumes. When newtechnology is developed, other unintended uses often surface. Such was the casefor the cold box. Developed for space, it ended up in Antarctica, not forkeeping things cold but for keeping them warm. 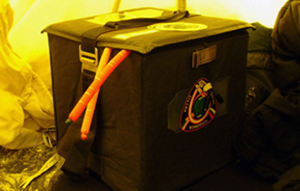 In 2006-2007, I had the goodfortune to live in a tent about 200 miles from the South Pole during ascientific expedition to Antarctica as part of a meteorite gathering teamcalled ANSMET (Antarctic Search for Meteorites). The conditions found inAntarctica preserve and concentrate meteorites, a discovery not realized untilthe early 1970’s. They accumulate on the surface of the blue glacier ice, andbecause they appear as strongly contrasting black specks from a distance, theycan be recognized from afar and gathered like cosmic Easter eggs. For the last30 years, annual expeditions working during the short Antarctic summers havegathered over 20,000 meteorites. During our six-week stay, we advanced thisnumber by 850. Living in atent under primitive conditions, the ambient temperature danced around -20° C throughout the continuous daylight ofthe Antarctic summer day. Including wind chill, the effective temperature was-40° C. At such temperature levels, it does not matter what scale is used.In our tents, the floor temperature stayed at -20° C and the chimney varied from -20° C to +20° C, depending on whether the stove waslit. Any water-based substance became a frozen lump. Most electronic devicesrefuse to operate under these conditions; from batteries that do not makesparks (lithium-ion batteries do not like to be charged if less than 0° C), LCD displays that give only blankstares, or hard drives that do not turn at the right speed. The Antarctichot box in its former life was an engineering test article used to make thermalmeasurements for the design of the spaceflight units. Having served thatpurpose, I found it in a dank NASA cabinet, itself in cold storage andseemingly of no further use. 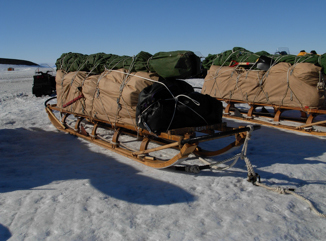 Brought out from retirement, this high-tech spacecooler found itself strapped to a Nansen sledge, pounding through the Antarcticinterior over snow structures known as sastrugi. In a sea of cold, it offered asmall oasis of warmth. We also kept our Tabasco sauce and sourdough starter inthe hot box, demonstrating the value of having small comforts when living onthe frontier. Thus we beholdthe new treasure garnered from the frontier of space. Not gold or spices, butknowledge. Knowledge always has value, even if we don’t immediately know orrecognize it. The real treasure of new exploration is the larger knowledge baseand the expanded imagination we develop from it. In time, all knowledge showsitself to be useful in some way. The fact that today it is difficult topinpoint the value of space exploration shows that it is truly venturing into terra incognita, unknown territory. Don’s blog also appears atairspacemag.com. Tierra del Fuego, the land of fire, was what Magellan named the tip of South America in 1520. He saw the fires set by local inhabitants who did not want the Portuguese explorer to set foot on their land. A new page in the history of this distant part of our globe is now being written. Oil has been discovered off the eastern shore of Tierra del Fuego, and Argentina is building offshore platforms to access it. 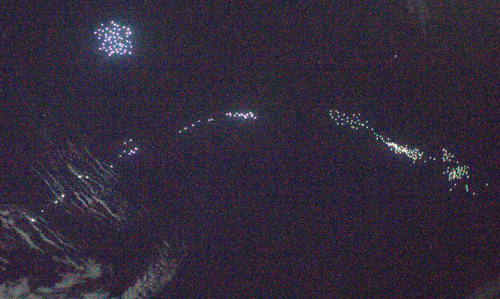 Brightly lit, they appear from orbit as constellations—not in the starry sky, but on the surface of the sea. Collectively, they are one of the most brightly-lit areas I have seen anywhere on Earth (except for Las Vegas, which still holds the title). From my orbital perspective, this is no longer Tierra del Fuego but Mar del Fuego. 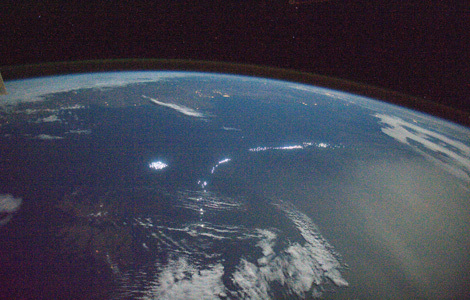 In these pictures taken from Space Station, the dim lights from Tierra del Fuego, visible in the background, do not hold a candle to the bright lights of the offshore oil platforms.